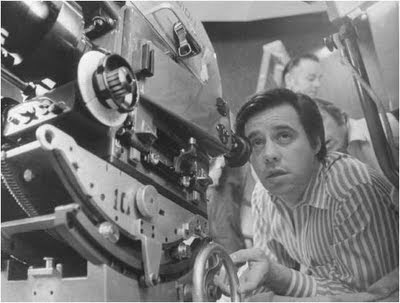 In 1963, cult movie director Peter Bogdanovich sat down with Alfred Hitchcock for a lengthy interview. At times, Hitch was more forthcoming about his artistic intentions in this talk than he was with his famous week-long interview with Francois Truffaut. Put another way, when you place the two interviews together, you can get a more well-rounded view of the inside of Hitch's head. Since we've been talking about Hitchcock's view of "pure film," I thought I'd share this revealing portion from Hitch's sit-down with the director of The Last Picture Show and other great films. This isn't Part Three of my series, it's just an interlude. Bogdanovich: In Psycho, aren't you really directing the audience more than the actors? Yes. It's using pure cinema to cause the audience to emote. It was done by visual means designed in every possible way for an audience. That's why the murder in the bathroom is so violent, because as the film proceeds, there is less violence. But that scene was in the minds of the audience so strongly that one didn't have to do much more. I think that in Psycho there is no identification with the characters. There wasn't time to develop them and there was no need to. The audience goes through the paroxysms in the film without consciousness of Vera Miles or John Gavin. They're just characters that lead the audience through the final part of the picture. I wasn't interested in them. And you know, nobody ever mentions that they were ever in the film. It's rather sad for them. Can you imagine how the people in the front office would have cast the picture? They'd say, "Well, she gets killed off in the first reel, let's put anybody in there, and give Janet Leigh the second part with the love interest." Of course, this is idiot thinking. The whole point is to kill off the star, that is what makes it so unexpected. This was the basic reason for making the audience see it from the beginning. If they came in half-way through the picture, they would say, "When's Janet Leigh coming on?" You can't have blurred thinking in suspense. "It's using pure cinema to cause the audience to emote." Wow. In exactly ten words, that could be Hitch's mission statement. Another tidbit, regarding character development: Hitch's statement that "we didn't have time to develop the characters" is only partly correct. While there may not have been time in the movie for more character development, the fact is that screenwriter Joseph Stefano developed his characters to a much greater extent than we see in the final cut. To the writer's chagrin, Hitchcock repeatedly excised that material from his drafts. For instance, Stefano wrote in hints of a budding romance between the Vera Miles and John Gavin, but Hitch took that material out. In his comments to Bogdanovich, we can see why. I love Hitch's concluding statement: "You can't have blurred thinking in suspense." That explains why he famously 'directed his audience.' Like an orchestra composer and conductor, he was eliciting a very specific set of emotional responses. Such an approach took a great deal of control over all aspects of the film, including even its marketing, of which Psycho is a case study!